Early in 2015, Georgia breweries won a small, if somewhat goofy victory when the state legislature passed a law allowing them to sell beer directly to customers who take brewery 'tours' The beer came as a 'free souvenir' that beer attendees could take home, so as the brewers figured it, the price of the beer should be naturally worked into the price of the tour. In September, the Department of Revenue reinterpreted the law. It issued a bulletin saying a brewery's 'tour' prices could NOT be based on the value of the beer given during a tour and that those tours could only include a limited amount of 'free' beer at the end: up to 36 ounces of free malt beverage to each tour attendee in a calendar day in free tastings, and up to 72 ounces of beer as a free souvenir. After a backlash, including statements from the legislature that that had not been its intent, the Department relented, but the ‘tours’ and the prohibitions on per-pint pours in a brewery taproom and on brewery beer sales out-the-door continued. Good background on the current state of brewery affairs in Georgia: the mandated brewery 'tours,' via The Federalist (19 October 2016). A barrel of a beer is not a physical container; it's a unit of measurement equal to 31 gallons (248 pints). 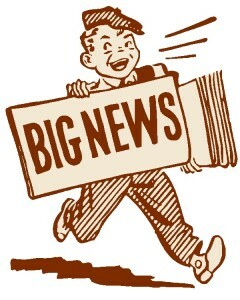 Thus SB 85, if passed and signed into law, will permit a brewery to sell 744,000 pints of beer per year in its taproom. 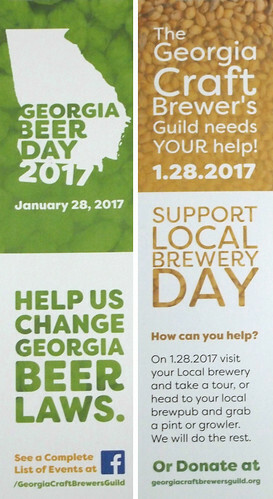 The Guild has a list of Georgia Beer Day events at its Facebook page. As of today (Thursday), it lists only 21 participating breweries, brewpubs, and pubs. Consider it incomplete; for a more inclusive list, ask your local bar or brewery how they will be celebrating and helping on Saturday. Beer Guys Radio's list of Georgia breweries here. Google map: here.